We should not buy any products from Japan or do business at stores that sell their products until this genocide ends. The Japanese may begin to have more respect for our views when they are no longer getting our money. I have previously purchased Toyotas and Hondas when shopping for a car. Not any more. Thank you Charlie, you are exactly right, hit them where it hurts, financially. IN LESS than two weeks, an annual event that environmental activist Ric O'Barry calls a genocide will begin. By the time it ends in March, as many as 23,000 dolphins will have been ''harvested'' in Japan. The lucky few will be shipped off to aquariums around the world, to spend the rest of their lives performing. The unlucky ones will be brutally slaughtered, their carcasses butchered for sale in Japan - often deliberately mislabelled as whale meat - or merely dragged out to sea and left to rot. This grim scenario is laid bare in a documentary, The Cove, which follows the efforts of Mr O'Barry and his colleagues to reveal what goes on at the Japanese fishing port of Taiji. Mr O'Barry will present the film at a special screening in Melbourne tonight, having just shown it in Broome, which is Taiji's sister city. He is hoping to persuade the West Australian town to suspend that relationship until Taiji stops the annual slaughter, which begins on September 1. 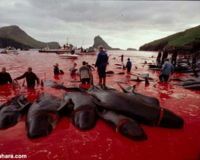 The documentary ends with gruesome scenes in which the eponymous cove fills with blood as fishermen hack into the trapped dolphins with harpoons and knives. ''That's nothing. That's the Disney version of what we captured,'' Mr O'Barry insisted yesterday. In the eyes of the Japanese fishing authorities, the slaughter comes under the heading of ''pest control'' - reduce dolphin numbers and you increase the fish catch. ''It's really about genocide. The Government wants to kill the competition,'' Mr O'Barry says. While some environmental activists have known about the slaughter for a decade or so, most people in Japan and beyond remain oblivious to it. Mr O'Barry, 69, has been campaigning on behalf of dolphins for 40 years. After five years in the US Navy, he became a trainer at the Miami Seaquarium in 1960. Three years later, he landed a job on the TV series Flipper, training dolphins. He became an activist the day after his favourite dolphin, Cathy - one of six who played Flipper - died. She had become miserable in captivity, and one day swam into his arms and simply stopped breathing. ''She committed suicide. There's no doubt in my mind,'' Mr O'Barry says. Trevor Long, director of marine sciences at Sea World on the Gold Coast, says his park is vehemently opposed to the dolphin harvests and Sea World has been a signatory to protests directed at the Japanese Government. ''We totally condemn the slaughter,'' Mr Long says. He says none of the 31 dolphins at Sea World are from Japan - 60 per cent were born at the park. Despite the likely impact of The Cove, Mr O'Barry is convinced the argument in Japan will not be won on economic or environmental grounds. Ultimately, it will come down to safety. The film includes a claim that tests have revealed mercury contamination of up to 2000 parts per million. In Japan, the maximum allowable level in fish is 0.04 parts. Mercury poisoning causes serious birth defects. There will be a preview charity screening of The Cove at Cinema Europa, Southland, tonight at 6.30, followed by a question-and-answer session with Ric O'Barry. Tickets are $20." Thank you, Simone.I already had this copied when I was told it was already posted. And that's what originally started the Great Imbalance of eco-systems---humans HAVE to WIN, no matter what the cost to others. And until that way of thinking changes, we're doomed. We were told 2000 yrs ago how to survive--SHARE, and thinking of OTHERS first.